Last Sunday the 'Shop Contest said "I do" to Bejeweled's cartoon-crazy cubic zirconium. We've got 20 winners—and one animated .gif—plus Ruizc inside! Getting everything started, Zak Canard (19) went well off the map and looked to another PopCap title to create his bloody-good shop. SphessMahreen (16) took a ridiculous-sized gemstone up to an even more ridiciuous scale for his entry. jamaicanmecrazy (8) reminds us all that, no matter how good the loot looks in Borderlands, diamonds aren't forever. JimThePea (9) mines quite a gem for us. Cyanid.Pontifex (5) and Laodicea-Dude (11) show there's no serious moment that can't be lightened up without a giant Ring-Pop. Kolibri (10) summons Captain Planet. Puppetpal (14) doesn't want a girl like the one who married Dad. It would take a smarter man than me to connect this ring to stamp.your.foot's (17) crime scene. Overall winners? 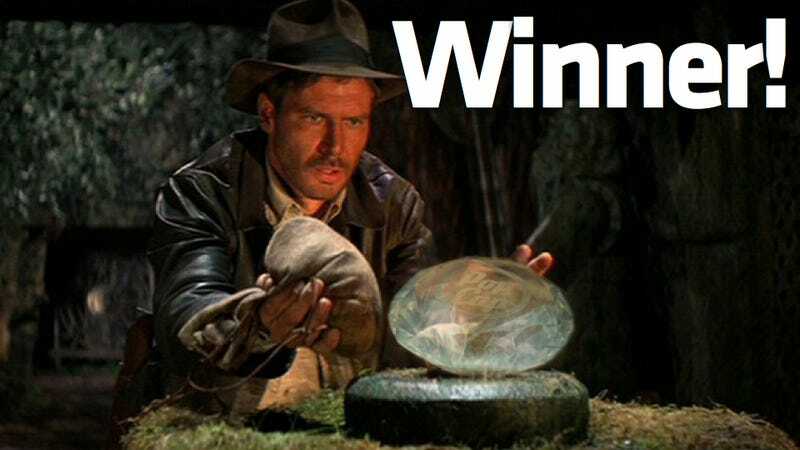 Gonna have to go with the three Indiana Jones submissions. clumsyninja (4), gets things rolling along. I'd give it to ChaosBuffet's (3) animated .gif if only we had a PG-13 rating! Can't see that? Overall winner Ruizc (15) makes the switch. Thanks to everyone who participated. We'll have a new 'Shop Contest Challenge tomorrow.